The composer who was gassed, the composers cut off from their royalties - and the one who gave his life to save his wife. You'll be touched by these stories of how the First World War affected great musicians. 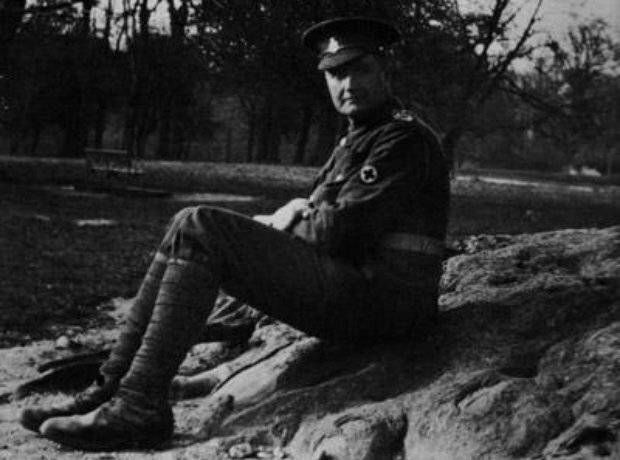 Vaughan Williams enlisted as a private in the Royal Army Medical Corps. After a gruelling time as a stretcher bearer in France and Salonika, he was commissioned as a second lieutenant in the Royal Garrison Artillery. His inspiration to write his Symphony No. 3 came during the war, after hearing a bugler accidentally playing an interval of a seventh instead of an octave. One of the most promising composers of his generation, best known for 'The Banks of Green Willow', Butterworth served as a platoon leader. He was shot by a sniper during the battle of the Somme. His body was never recovered. Bliss (pictured right) fought in France in the Royal Fusiliers until 1917, and then in the Grenadier Guards till the end of the War. He was wounded twice and gassed once. His younger brother Kennard (left) was killed in action. The death deeply affected the composer and had a lasting effect on him. Elgar based a 1917 song-cycle, 'The Fringes of the Fleet', on wartime nautical poems by Rudyard Kipling. They were premièred in a variety show at the London Coliseum. Kipling was upset at a later performance, after his son was reported missing. An Olympic Gold Medal winner for rowing in the 1908 London games, Kelly was wounded twice at Gallipoli, where he wrote his most enduring composition, an 'Elegy' for his friend, the poet Rupert Brooke. Kelly himself died aged 35 in the Somme. Considered the most promising German composer of his generation, Rudi Stephan was killed at the age of 28. He died after being shot in the head by a Russian sharpshooter on the Galician Front. Delius moved from France to England to avoid the hostilities. He revised his 'Requiem' and dedicated it “to the memory of all young artists fallen in the war” after his nephew died in action. The première of Delius's last opera, 'Fennimore und Gerda', intended for the Cologne Opera, was delayed by the war and did not take place until 1919. When the war broke out, Sibelius found his royalties from abroad cut off. He had to compose numerous small pieces for Finnish publishers to avoid bankruptcy. He spent much time during the war years working on his Fifth Symphony. On 24 March 1916, a German torpedo hit the cross-Channel ferry Granados was travelling on. The composer drowned after he jumped out of his lifeboat to save his wife, who also perished. Ravel tried to enlist as a pilot but his age and health were against him. He entered service instead as a truck driver. He dedicated his piano suite 'Le tombeau de Couperin' to the memory of specific friends killed in battle. Originally ruled unfit for military service, Holst was offered music work at the end of the War with British troops in Salonika awaiting demobilisation. Because his surname looked too German, he had to change “von Holst” to “Holst”. Puccini was criticized during the war years for working on the opera 'La rondine' which had been commissioned by an Austrian theatre. Staunchly apolitical, Puccini did not participate in the public war effort, but privately helped individuals and families affected by the conflict. Moeran suffered lifelong health problems from wounds he received while serving as a dispatch rider. Although he survived, he was deeply affected by the war. His Symphony in G minor has been described as his “war requiem”.